The design of the street network has a fundamental and measurable influence on each of the above. Later changes – to land use pattern or to the local design of streets (eg road widening or narrowing, adding cycle lanes or public transport) – can enhance or even diminish these potentials, but such later changes always occur around a benchmark that is set by spatial configuration decisions. Buildings come and go – are built and demolished – but the spatial network, once laid out, is harder to adjust. Exceptional new connections – such as bridges – can be built to connect disconnected networks but grids are resilient to change. Therefore, putting the wrong grid into an urban development can be a pathological move, setting the socio-economic potential of places for generations to come. The evidence-base: post-war housing estates; UK New Towns. Places that go wrong within a generation, if that – sometimes within a few years. Car-dominant transport planning. Land use zoning. Risk of failed UK models. – mixed use planning: marginal separation by linear integration. – mixed mode planning: roads, streets, lanes, canals: Jiading. What are the Spatial Layout requirements? The historic Chinese grid: rectilinear hierarchy. The comparison between SkyCycle – a proposal to create a network of strategic cycling routes above London’s radial railway lines – and the City of London’s much maligned network of (unbuilt or demolished) upper level walkways is one worthy of attention. 1. The City of London “Pedways” often paralleled routes at street level. When they did so they effectively split the pedestrian flow between upper level and street level – thus typically making neither level particularly/sufficiently vibrant. This is why most of them did not work or were resisted from being built in the first place. However, as all good students of spatial networks understand, not all links are equal. When upper level walkways genuinely create routes that are not available at ground level then the evidence of observation surveys shows that they can be very well used. Some of the upper level routes through the Barbican are as well used as ground level residential streets elsewhere in London. Reality is, as always, more subtle than simplistic classification. 2. In contrast, SkyCycle follows railway lines that have historically created morphological “fissures” in the street network either side of them. In this way SkyCycle does not recreate routes that are already available. Instead, it create new routes. 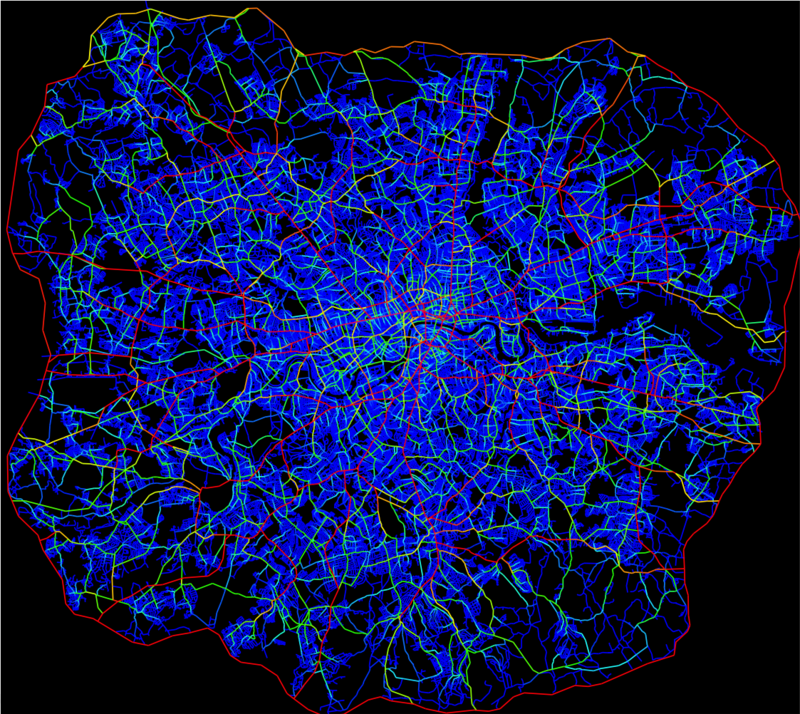 a) because they connect directly from the edge of London to the centre, linking to the ground level at accessible points in the street network (identified by Space Syntax through spatial accessibility analysis) SkyCycle routes add to London’s “foreground network” of important arterials (the red and orange links in a Space Syntax map of London).